Ali al-Nimr was sentenced to death in Saudi Arabia after being arrested for attending a pro-democracy rally when he was 17. Imagine this  your teenage son or daughter in the place of this boy. What kind of regime does this? What kind of regime are we supporting, while turning a blind eye to this and the hundreds of other dissidents jailed and killed without a real justice system? Saudi Arabia has added to their human rights abuses with their new anti-terrorism law, which is being used to justify torture and killings of dissidents. Using social media to criticize the state is now terrorism in Saudi Arabia. Saudi Arabia is not liberalizing. It is not opening, changing, or modernizing in anything other than superficial ways. Additionally, it continues its blockade and war in Yemen, which has killed tens of thousands of lives, left millions near starvation, and threatens an entire nations population. Why do we not act? The stated reason is our relationship with the Saudis, which boils down to two things  oil and defense contracts. I stand with those who believe we shouldnt sell arms to the Saudis unless they change their behavior. We are aiding and abetting this behavior. Ill work once again to cut off the sales of arms to them and will continue to press for other measures to pressure them into change. There are those who believe some sanctions on the people who killed Khashoggi is a good response. I disagree. It is inadequate and misguided. Do you think anyone in power in Saudi Arabia cares if their underlings are sanctioned? No. Also, stopping arms sales is a more proportionate response. Sanctions that end all trade with Saudi Arabia might produce more global turmoil than we bargained for. We must take real action to force real change, and that starts with arms sales and aid in the Yemen war. I will look for every opportunity to fight this battle in Congress. None of our business. America first. What the h*ll is it with Rand Paul. This creep was a Muzzy Brotherhood agitator and asset. The Saudis may be sh*t but Prince Salmen is being very helpful to us. I don't care how many pro-Islamist hacks his goons off, the more the better. The sheer amount of dollars for military hardware and services the Saudis are buying is worth a few thousand of the likes of Kashogi alone. Does Rand really believe this sanctimonious crap or is it just politician posturing. In either case he needs to get lots of mail saying Rand F off on this one. These dumba**es get high on the exhaust from their own tailpipes. Jamal Khashoggi was Muslim Brotherhood and a jihadiscum supporter. The new boss of Saudi Arabia is eliminating jihadiscum supporters and getting out from under the Muslim Brotherhood. The death of Jamal Khashoggi was a Good Thing. Just take a peek at all the bodies the Clintons have buried in the backyard! No. What Rand Paul misses here is who chooses which dissidents to save. Hint: It isn't concerned U.S. citizens. It is the Progressive Media. Saying the U.S. must go against its own interests to save dissidents is saying the U.S. must let the Progressive Media decide on U.S. priorities. That is the essence of what is being done here. Why was Khashoggi singled out to be avenged? Simple. To put President Trump in a bind. That is all. President Trump is wrestling control of the U.S. Government from the Progressive Media. Once there exists a plethora of media choices with different ideologies, the U.S. can use its power to help dissident in ways that advantage the U.S.
Khashoggi is an example of exactly the wrong way to do it. 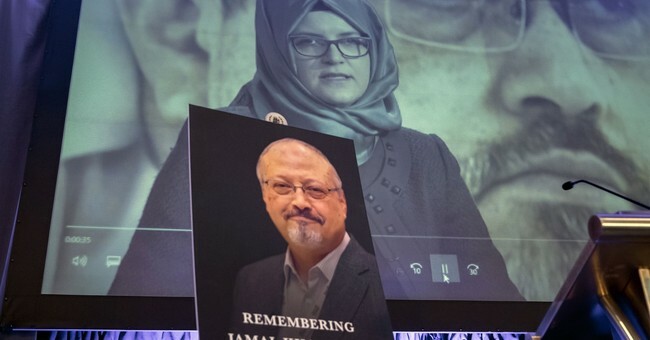 If Saudi Arabia is not held accountable for the barbaric murder of Khashoggi, what will it mean for the fate of other dissidents held in Saudi Arabia and elsewhere who are being held without trial? If I recall correctly, The Shah of Iran was put into power in the 1950s, and for the entire time of his rule, I think his secret police killed about 3,000 people. When the Ayatollah took over, they killed 3 times that many the first year. Undermining an ally because of their totalitarian methods of dealing with troublemakers is stupid. The current King is modernizing Saudi Arabia in the manner the Shah of Iran was modernizing Iran, and I have little doubt he is going to need to kill a lot of troublemakers. What does it benefit us or the world to interfere in what he believes he needs to do to drag his people into the 21st century? Trying to force them to live by our standards presumes a moral underpinning in their culture that does not exist. All we will do is make things worse. The 3,000 or so the Shah killed is nothing compared to the millions that have died under the power of the Ayatollahs. We should not be penny wise and dollar foolish. One Mooselimb kills another Mooselimb. It is what they do, kill anyone around them: Jew, Christian, Hindu, other Mooselimbs. Don’t care when they kill themselves. We can't expect people in all countries to conform to our way of thinking and doing things. Saudi Arabians are not Christians or Jews, they are Muslims that have their own ideas about right and wrong and it is going to differ from our Judeo/Christian ideas. Muhammad, the perfect man by Muslim standards, had people who gave him a hard time, assassinated. So this type of behavior from Muslims should be expected , even though by our standards we won't tolerate it in our country. So if you are out in the woods and see a bear, even though you don't have any ill will in your heart please don't go over and give the bear a pat or a hug, bears have different standards than we do. how about justice for all of the Clintons’ alleged Arkancide victims? Not even a US asset, but rather the asset of the Muslim Brotherhood. So how could it possibly be worth destroying the balance o power in the Middle East, to the peril of Israel, our very best friends in that region. The Saudis are a rough crowd, So they fight amongst themselves. None of our business. Nice virtue signalling. That and $3 will get you a starbucks. Hello MBS? Got another one for ya. Can I have the head? So if hes so concerned about journalists, what does he have to say about the way Julian Assange is being treated? Crickets. He’s a chip off the old Paul. They’d be okay with the U.S. being destroyed to have any chance of seeing Israel destroyed. Khashoggi was working at his plan for “political Islam” to gather the whole Middle East against the U.S.A. Paul is most likely aware of that and nuttier than a fruitcake. The entire Saudi royal family are pro-islamist goons. We should nuke them and be done with it. Coming soon to a country near you.